Practical Wellbore Hydraulics and Hole Cleaning Ramsey Mark S.
Auteur : Ramsey Mark S.
Hydraulic design is a critical and big part of any drilling operation, but drilling engineering and managers must search through multiple applications to gather all the solutions. 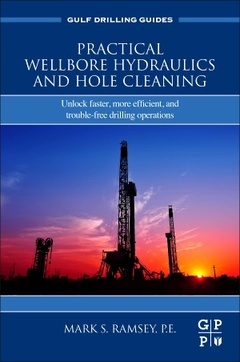 Practical Wellbore Hydraulics and Hole Cleaning delivers one resource with the needed explanations, equations, and descriptions important for wellbore hydraulics including hole cleaning. Involving many moving factors, and complex issues, this product provides a systematic and practical summary of the solutions, helping engineers understand and answer through calculations, case studies, and guidelines not found anywhere else. Topics such as impact of temperature and pressure of fluid properties are covered as well as vertical and deviated-from-vertical hole cleaning differences. The importance of bit hydraulics optimization, drilling fluid challenges, pressure drop calculations, downhole properties, and pumps rounds out the information contents. Packed with example calculations and handy appendices, Practical Wellbore Hydraulics and Hole Cleaning gives the drilling engineer the tool necessary for effective bit hydraulics and hole cleaning operation design. Mark Ramsey is currently Principal and Owner of Texas Drilling Associates and founded the firm in 1992, covering well planning, estimating, logistics, contracting, rig team training, execution, and completion using state-of-the-art intelligent completions technology. Clients include BP, M-I, Petrobras, Baker, Amoco, Cabot, ExxonMobil, Schlumberger, Transocean, Devon and GPRI (of Texas A&M) and projects have been worldwide, most notable the M-11 well which holds the world record for extended reach well at Wytch Farm. He also authored Schlumberger's drilling portion of their highly utilized online glossary and teaches public drilling schools worldwide. Mr. Ramsey previously worked for ExxonMobil in drilling research, owns 7 patents, and earned a BSME in Engineering from Texas Tech University and is a registered Petroleum Engineer in the state of Texas.